Age is a major determinant of circulating total IGF-I levels. After a peak in puberty, mean circulating IGF-I levels decrease 2.5-fold by the third decade, while a further two-fold decrease occurs between the third and eighth decades. Besides growth hormone (GH), age, nutrition and a number of other factors, individual circulating IGF-I concentrations are also influenced by a number of genetic factors. Twin studies have shown that at least 38% of the interindividual variability in circulating IGF-I levels is genetically determined. The IGF-I .gene contains a microsatellite polymorphism approximately 1 kb upstream from the IGF-I gene transcription site. This IGF-I gene polymorphism may directly influence the IGF-I production. This IGF-I gene polymorphism has the potential to influence the expression of IGF-I and could therefore serve as a better indicator for chronic IGF-I exposure in the body, both locally and systemically, than the actual circulating IGF-I concentrations. This IGF-I gene polymorphism makes it possible to characterize, on a genetic basis, subjects who are chronically ( i.e.,life-long) exposed to low IGFI levels throughout the body. In the Rotterdam Study, a population-based study in a Caucasian population aged 55 years and over, 10 different alleles of a genetic polymorphism were observed in the regulatory region of the IGF-I gene. Genotype and allele frequencies were in Hardy-Weinberg equilibrium. When considering genotypes, 88% of the studied subjects from this population-based sample were homozygous or heterozygous for a 192-bp allele, suggesting that this is the wild-type allele from which all other alleles originated. The frequency of the other alleles was low and therefore it was decided to pool these other alleles in the further analyses. This pooling resulted in three possible genotypes: 1) carriers homozygous for the 192-bp allele (46.7%), 2) carriers heterozygous for the 192-bp allele (41.7%), and 3) non-carriers for the 192-bp allele (11.6 %). Mean circulating total IGF-I levels increased with the number of 192-bp alleles carried. In non-carriers of the 192-bp allele, the mean circulating total IGF-I level was 18% lower (16.7 nmol/L) than in those homozygous for the allele (20.5 nmol/ L, P=0.003). In addition, body height significantly increased with the number of 192-bp alleles present. In those homozygous and heterozygous for the 192-bp allele, fewer subjects with type 2 diabetes or myocardial infarction were observed than in non-carriers. 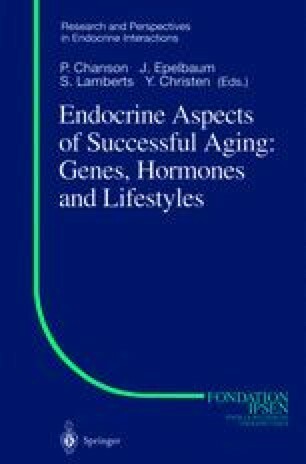 Although the IGF-I genotype was not associated with known cardiovascular risk factors, such as age, male gender, smoking, body mass index, WHR, total cholesterol, HDL-cholesterol and hypertension, both the risk of type 2 diabetes and myocardial infarction were significantly increased in non-carriers of the 192-bp allele when compared with carriers of this polymorphism. This finding suggests that the genetically determined exposure to relatively low IGF-I plays a role in the pathogenesis of both type 2 diabetes and myocardial infarction. An age-related decline in circulating total IGF-I levels was only observed in those homozygous for the 192-bp allele, but such decline was not found in heterozygotes and non-carriers of the 192-bp allele. We hypothesize that this IGF-I gene polymorphism directly or indirectly influences GH-mediated regulation of IGF-I secretion with aging. In conclusion, circulating IGF-I levels are determined to a considerable extent by genetic factors. Genetically determined chronic exposure to low IGF-I levels is associated with an increased risk for type 2 diabetes mellitus and myocardial infarction.